When I was growing up, my friends and I used to frequent a coffee shop in the mall that sold all kinds of fun frothy drinks. We used to love an iced white chocolate drink they sold topped with whipped cream and these little chocolate crunchies. It's something that I haven't tried in years (I don't even know if the shop is still there), but when I was experimenting with recipes for my recent DIY Hot Chocolate Bar Party, I accidentally put together a drink that tasted just like that long ago favorite. This Whipped Vanilla White Hot Chocolate with Cocoa Nibs is a luscious alternative to the usual hot chocolate. Made with creamy white hot chocolate at the base, and spiked with Smirnoff Whipped Cream Flavored Vodka, it's a decadent winter treat. I top it off with a generous amount of real whipped cream, and garnish with a cherry and roasted cocoa nibs. Yields 1 serving. Multiply as necessary. Add vodkas to a mug and top off with white hot chocolate. 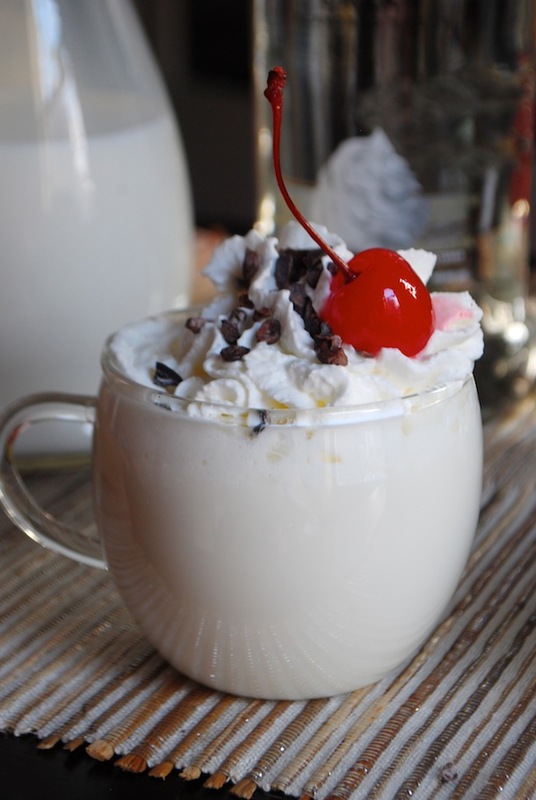 Garnish with whipped cream, roasted cocoa nibs, and a maraschino cherry.